All of our concrete repairs team members are qualified technical rope access workers with level II qualification at the least. 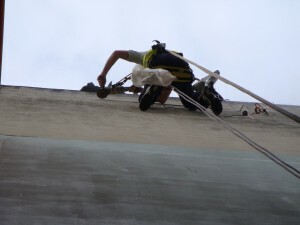 Our expert team of high rise industrial rope access workers can also do facade concrete repairs. You have may have already seen our abseilers doing rope access high rise window cleaning around Sydney as we have many teams working in the Sydney CBD. We do window cleaning from rope access or BMU (Building Maintenance Unit). We also cater on performing many other types of maintenance services. Call or eMail us to see what we can offer you. Sydney high rise concrete repairers servicing Sydney CBD are performing rope access concrete repairs for difficult to access areas. Our repair team members all utilise abseiling equipment attached safely to pre-installed anchor points in two individual points. The rope is then attached to another rope with industrial descender equipment supplied from a Single Rope Technique in Padstow. Concrete repairs in Sydney is inherent due to the city’s proximity to the ocean. As salt travels inland to over 100 kilometres, the salt, when air bourne combined with strong wind currents and rain, gets absorbed into the concrete where the internal steel re-inforcing is within 25mm to the surface normally. This will start corrosion and can easily expand through internal steel rusts. This will result to an expanding force that may blow out or spall the surrounding concrete. This process results in the term Spalling or Spalled Concrete. The method required for concrete spalling repairs needs an access to the area through Industrial Rope Access. The accessibility provided to the repair person will allow removal of damaged concrete surrounding the affected area by using a grinder to square cut down through to the internal steel. Preparation of the internal steel requires all rust and laitance to be removed using abrasive power tools down to bare white steel first. However, where loss is greater than 10% of the steel, the procedure will require replacement in consultancy from a structural engineer and cutting square edges to minimum of 25mm. Patching requires application of Sika Monotop 610 internal steel treatment sink coating to be applied as specified by manufacturer’s directions. Then, apply Sika Monotop 615 HB or CI to the wet Monotop 610 (as the 610 is also a bonding bridge). Fill the affected areas with Monotop 615 and finish with concreting techniques to best match the existing finish of the facade. Allow to cure for 48 hours before painting.